Enjoy an extensive tour of the city! You can see and experience the Moroccan culture in just one day! "Nice trip but would have liked to see more sides and less selling"
From Malaga (and east): Tuesday & Saturday. From Torremolinos to Marbella: Tue, Thu & Sat. Meeting Point: Pick up from Malaga, Torremolinos, Fuengirola, Marbella, Nerja and more. Walking Guided Tour in Tangier. Lunch Menu is included in this trip. Multilingual Tour Guide. Multilingual tour means the tour guide always will speak in english, spanish, german, french and italian if it is necessary. This guided tour to Tangier is made for those who want to have a glimpse of Morocco in a day trip from Malaga for a good price enjoying the excursion with an international group. Please, consider Tangier is quite far away from Malaga, even you need to cross the Mediterranean Sea, so the time in Tangier will be optimized to see the most important highlights of this great city. You will go by bus to Algeciras or Tarifa. 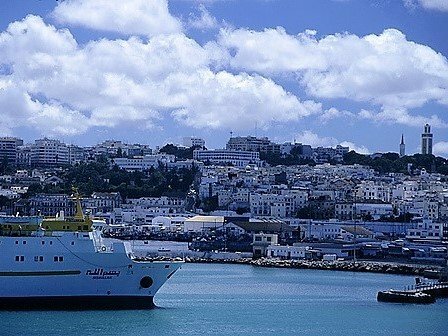 There you will embark on a Fast Ferry to Tangier (60min), the Moroccan city. During the journey the guide will inform you about the programme of the day, the landscapes and the towns you will see on the way and will help you complete the formalities for crossing the border. Upon arrival in Tangier a coach and a local guide will be waiting for you at the harbour. You will experience a sightseeing tour in Tangier through the modern part ofthe city where you will see, among others, the Residence of the Governor, the Summer Residence of the King, etc. There is a small stop in a parking lot to take pictures with the camels if you want (a tip is usually given to the berber taking care of the camel). After the sightseeing tour, you will start the visit of the historic centre of Tangier on foot. This Walking Tour around Tangier is quick and fast moving. 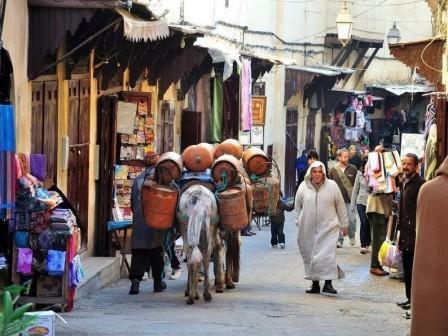 You will visit interesting places like the Kasbah, the Tangier's Medina and the Souk. 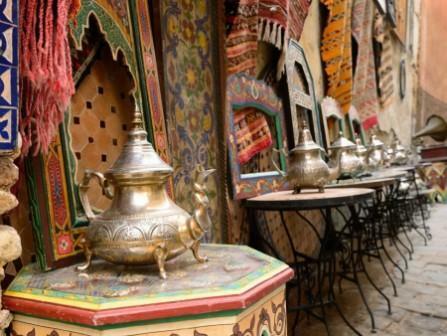 After the visit you will taste the exotic Moroccan food at a typical restaurant (included). 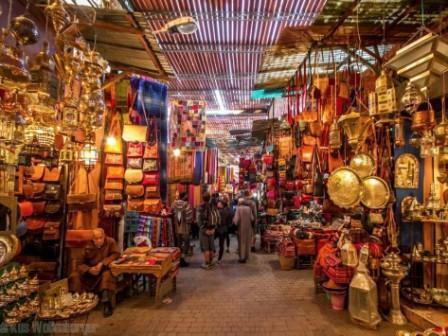 After lunch, if the itinerary of the trip permits it, you will have the opportunity to visit a typical bazaar where you can see how traditional Moroccan carpets are made, as well as traditional slippers, djellabas and leather objects. 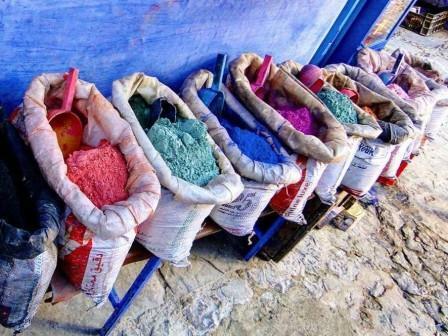 You will also visit a Barbary pharmacy, also called a spice shop, where the locals will show you the natural cosmetic products and the spices they use in the Moroccan cuisine. Finally, you will be taken back to the port and then back to the Costa del Sol. This tour have multiple pick-up stops. The coach begins picking up passengers in Malaga and finishes its pick up route in Estepona. Please note this itinerary and schedule of the trip are subject to changes of timing from November to April due to ferry’s timetables and the Ramadan holiday. In case there is a change on the time we will email to you after the booking. British, European Union (EU), Australian, Canadian, USA and Japanese nationals. Algeria, Andorra, Argentina, Australia, Bahrain, Brazil, Canada, Chile, Congo (Brazzaville), Gabon, Great Britain, Guinea (Conakry), Hong Kong, Iceland, Indonesia, Ivory Coast, Japan, Kuwait, Liechtenstein, Mali, Mexico, Monaco, New Zealand, Niger, Norway, Oman, Peru, Philippines, Puerto Rico, Qatar, Russian Federation, Saudi Arabia, Senegal, Singapore, South Korea, Switzerland, Tunisia, Turkey, United Arab Emirates, United States of America, Venezuela. Passport Control in the border (specilly in summer). Fast Ferry time: It depends from the sea and the ports. Free cancellation until 1 day(s) before starting time. "Wonderful experience. Great guides. Fascinating trip." "My daughter and I took the day trip to Tangier. It’s was a long day, but overall a great one. Everyone was extremely nice & friendly. Your guide warns you about the street vendors before you get off the bus...they are very pushy but I enjoyed being part of the environment. My only complaint was I wished we had more time to shop. There is a lot of walking, so be prepared. " "I had a wonderful time visiting Tangier with this group. The guides were very informative and a lot of fun! We had a few guides to help with the language differences and to let people shop longer or sit somewhere. I highly recommend this trip. It is just a taste of Morocco, but it tasted onderful!" "Really good tour! We were really tired but happy at the end of the day :) Our guides, Hans and Bashir were more than excellent, experienced and with an extensive knowledge of Tangier and Morocco. It's a long day trip, with many hours on a bus but if you think about the distance between Malaga and Tangier, trust us, it worth the effort. We highly recommend them." "A great way to have a taste of Moroccan culture when you are in Spain and have no time for a weekend trip. However, it would’ve been better if the tour was longer as it was a very long trip to Tangier (3 hours each way from Malaga)." "We met coach in Malaga at 5:30am yet did not board the ferry to Tangier until just before 10am abdcdrpsrted Tangier at 2:45pm. We did not visit the palace nor see the caves not see the snake charmer as advertised. The camel ride was no more than 30 seconds. While the walking tour was good and insightful the overall experience of travelling from 4am in the morning from Nerja to meet on Malaga at 5:30 to return to Malaga at 9:15pm and back home by 10:30 left a lot to be desired." Answer from Malaga Trips: "Thanks for taking the time to write this review, although there was an expectation of several things not offered in this tour: no palace, cave, nor snake charmer is offered and the camel is just for the picture, not a ride (camel ride is offered only at the 9 days desert tour). Regarding the time traveling from Nerja, we offered you a private transport to Tarifa for an additional payment to save all stops in the way, but you chose to meet the group in Malaga on your own. We will be glad to help other people interested in this tour (as it is described) by contacting us with their concerns to offer them all possibilities to make them more comfortable." "Very interesting. It was a good day. We had a good group. You travel for 10 hours, and you see morocco for 2 hours. You get a meal which was very tasty, and you get the "chance" to buy some souvenirs. You get some pressure to buy stuff but you can say no without problems (if you know how to say no). It was my first time to the continent of africa and it was worth it. The guide was exceptional and he speaked many languages and did a very good job." "For a first time visit to Morocco, a tour is the way to go. While it was a little cheesy the expected tour was as described by others. Picking up other passengers along the route was not a problem but the guide in Marsh Rocco left a lot to be desired. We were more herded than informed, in part because he spent a lot of time on the cell phone. There could and should have been a lot more description of what we were seeing. The person leading the Spanish oration of the trip to Tarifabwad. Much more professional and interesting"
"Lindo paseo para tener una visión panorámica de Tánger. Habría cambiado la visita a la tienda de alfombras por tiempo libre para vitrinear libremente. " "The guides were great. David did a great job of prepping us and making the passport stuff go smoothly. The day, though tiring, was very immersive yet very safe. " "Easy to book and professional service. We ended the day tired but it was worth it. Thanks!" "The guide was fabulous "
"Had a great time. Top quality bus, tour guide that spoke 4 German, Spanish, French and English perfectly. Well planned trip"
"We went to Tangier in Morocco on August 1st and we cannot recommend the tour due to the very rude and angry female guide in the end of the day. Moreover, there is a lot of waiting on the tour so I think it would be easier to take and plan the tour by yourself." "The day trip to Tangier was good for getting a small glimpse of Morocco in the amount of time that we had. Our guide from Malaga, David, was great. I was apprehensive about booking the trip due to some of the reviews, but I was glad that I did. It was fine. I enjoyed the day! " "We spent more time picking up passengers and dropping them off than our main trip purpose which is spending time in Morocco. In Morocco the trip was very fast and short. The guide was moving quickly and he was eager to let us return to our boat. You should assign two places only to pick up your customers and not to torture all the passengers by going from one city to another. This is crazy. However, the guide (David) was wonderful and helpful. But again, organizing the trip by getting the boat tickets and keeping the group together was hard for him. " "It was good. Our tour guide Michelle was a super Woman... she took care of 40 plus people incredibly... The Journey to tangier was very beautiful but also was long since it was just one day.. one day is not enough because one spends almost 8 hours back N forth .. one night stay in tangier is higly recommended since there is LOT to see and experience people and shop quite intresting things...."
"We went as a group of 3 girls and enjoyed our little taste of Morocco. The guide was really friendly and everything was well organized. One of the highlights was our visit to the spice pharmacy, the pharmacist was knowledgeable and charismatic. The downfall was our lack of time! We had only 10 minutes to explore the souk which wasn't nearly enough, and we completely skipped the trip to the camels and the opportunity to ride them. It was a good trip but felt we would have got our money's worth had we had a little bit more time especially as majority of our time was spent traveling there and back." "It was a waste of time and money. I was hoping to get a real cultural experience of Morocco. In fact, we visited 3 shops ( the organizers got money to get us there) - only one of them would be enough ( the scarf - manufacturer was ok, the carpets and the pharmacy' were totally unnecessary). The awful 'tourist- like food' was completely tasteless - in the land of spaces I would expect something with a little of taste... and in the end we got 10 minutes ( literally 10 min) of free time in the suk. Oh... I forgot to mention the camels - 3 camels on a filthy parking for pictures only)... the rest of the group was equally disappointed. The guide asked in the end if we enjoyed it, a few weak voices said yes but w/o signs of enthusiasm ( she assumed we were tired but we were just extremely dissatisfied). The whole trip is just about money- making - the organizers take the money from the tourist and from the shops. Nothing to recommend, really. " "I was very disappionted, looooong lines and to much sellingpoints, to few interesting points." "A great experience with an excellent guide. Two areas for improvement could be 1) get more Moroccan passport processors as the lines took far too long, and 2) this tour really should be listed as 14-15 hours instead of 13 hours. Otherwise superb!" "The only thing I did not like was the system the agency has to pick up people all over the city. I thought perhaps the majority of the people could meet at some place centrally and not have to go to be picked up at diferent locations. " "I am so glad that I found you. The arrangements for the trips (I booked 3 trips) were just fantastic. The guides were funny, lovely and very helpful. Juan was the best. And, Nicholas did a lot, which really helped me to plan my holiday. I hope more people select you as their guide for Malaga trip.. Cheers... "
"Ferry delay was a pain as it was a very early start to the day. The guide spoke more French than anything so we felt we missed a lot. Also he was very very persistent and insisting on being left tips." "Good and interesting tour! Everything was well planned, except for the ferry but that is not Malaga trips fault. Expect intense salesmen though. " "Trip was great other than some of the VERY aggressive street vendors that were desperate for you to buy something from them." "There were too many people trying to sell you something. The rug dealer was a special waste of time.I would much rather have someone show me how they made something and I might have bought something if I had a chance to browse through things and compare them like in a store, I feel sorry that I bought very little because I know these people are impoverished but I didn't want to be shamed into buying something I didn't want or need. " "Had a fabulous day. Well organised and very good guides save for we had to change buses on return trip and the driver dropped us nowhere near our drop off point. Not speaking g the language or knowing Malaga we felt stranded. It was a negative end to a lovely positive day. " "Wonderful trip, fast moving and informative. Our guide David, kept the multi-national tour group entertained and attentive. Great value for 15 hour programme." "We did not expect what we experienced. Our tour guide was wonderful and amazing. However, we didn't get to see tangier because we were pressured and stuck into three different sessions of SALES. No chance to shop, explore, food was bland. Not true to its cuisine, this will leave travels thinking that this is what Morocco is about, when it really isn't. Would not even recommend this trip to ANYBODY. Waste of money, most of all, time which is most precious because it's vacation. Reminder: our tour guide for transportation "David" from Malaga, was awesome and was the only joy about this trip. Everything else, was bad. And needs improvement "
"One of the best trips I ever have in every respect , the tour guides , Spanish and morrocans were absolutely very helpful and take every care to look after the group one by one specially in tanger old town zig zag narrow roads and markets/sok.many thanks for the organizer and management ." "It was my pleasure to travel by Malaga trips. The trip was very well organized. We had very good tour guide during our bus traveling and one more when we came in Tangier, who has guide us in unique architecture of Medina streets and markets. We had great lunch in traditional restaurant with Moroccan music and food. Nice presentation of traditional Morocco herbs, spices and medicines and very interesting carpet presentation. I recommend this tour to everyone, who would like to have experience of something different and unique! I'm glad that I was part of this adventure organized by Malaga Trips." "Had a lot of fun. Jorge took very good care of us. Was able to se a lot in so short a time. Would definitely recommend this trip to anyone. "